Stirling, who had the weekend off from his county duties with Middlesex, struck 115 not out from just 52 balls for his boyhood club, including nine fours and 11 sixes. 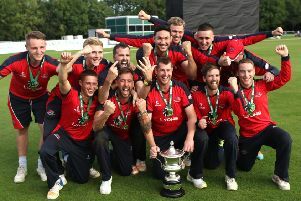 Armagh had posted 193 batting first thanks to 59 from James Rodgers but Stirling made short work of that target, with the help of 73 from Neil Cahill in a nine-wicket win. However, Armagh were furious that Stirling was even eligible to play, a grievance fuelled by the recent controversy over professionals in Section One. They had signed veteran Indian professional Indrajeet Kamtekar to return to the Mall, only for the NCU to tell them and several other clubs close to the start of the season that registrations for former first-class cricketers would not be accepted in light of new advice. Armagh have since signed the former Coleraine bowler Jarred Barnes. Stirling, it is understood, made a point of approaching many of the Armagh players after the game when handshakes were eventually exchanged. However, a Twitter spat involving people from different corners of the NCU continued well into Saturday night, with even Gary Wilson, Stirling’s Ireland international team-mate, weighing in to defend Cliftonville and voice his incredulity at Armagh’s concerns. ‘Yeah,imagine an Irish international playing for his home club, helping young guys. Shocking for local game to have players of his standard’ Wilson tweeted sarcastically. Ironically, this was the first time Stirling hit a century for Cliftonville in a senior fixture.